Fire crew 'saved by a miracle' driving through a hail of rocks on way to false fire report; police to accompany crews in Bedouin areas. 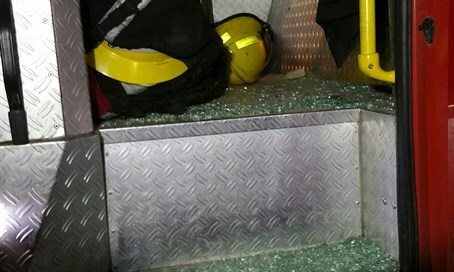 Firefighters on Tuesday night were dispatched to an alleged car fire at Segev Shalom, a Bedouin town just southeast of Be'er Sheva in the Negev, only to find an Arab rock ambush waiting for them. The fire department noted that "firefighters who were in the fire engine were saved by a miracle, after the commander of the crew decided to drive fast amid the rock throwing directed at him, on an unpaved path as their lives were in danger." Police forces were called to the scene, as was Negev district fire commander Eli Peretz, watch commander Moti Bukuvza and another firefighting crew from the Be'er Sheva station to put out the car fire. However, with the arrival of the additional forces, it became clear that the call reporting a car fire at the Bedouin town was in fact a false report. The discovery made clear that the call was a set up to lure the firefighters out into the rock ambush. In light of the incident, Peretz ordered all Negev district firefighters not to enter into Bedouin areas without police accompaniment, due to the potential danger to the lives of the fire crews. The firefighters submitted a complaint to the police, and then returned to their station.